Colorado Springs is home to some of Colorado’s best attractions, including Garden of the Gods, the Manitou Incline and Pike’s Peak. With all the incredibly scenery around Colorado Springs, staying inside isn’t really an option. If you are looking to get outside and adventure during your trip, head out on one of the ziplines in Colorado Springs! Here are the best ziplines within 2 hours of Colorado Springs. Head out on a thrilling 1/2 day zipline adventure with AVA in Buena Vista! The Mountaintop Zipline course is situated above beautiful Buena Vista, CO less than 2 hours from Colorado Springs. You will enjoy spectacular views of snowcapped peaks and the mighty Arkansas River as you zip from cliff to cliff between the pine and apsen trees. This course is located on 44 acres of undeveloped mountainside land and the platforms are built into the natural elements such as rock outcroppings and trees. This unique course also features additional exciting elements, including a swinging log bridge, hanging log staircase and 7 amazing ziplines spanning almost 4,000 feet of high-flying, heart-pumping fun! 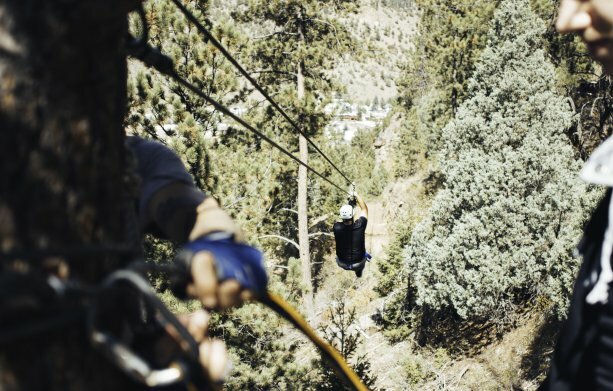 This Colorado Springs zipline tour is $89 for adults and $79 for kids ages 7 – 12. Book your tour online or by calling 855-947-7464. This course is situated in the natural terrain of beautiful Manitou Springs, Colorado. Fly through the hills of this Front Range zipline at over 6,500 feet in elevation on lines varying in length between 225 feet and 650 feet. This is a 5-line zip line course and costs $85 per person. Riders must be at least 6 years old. This outfitter also offers Jeep tours, segway rides and balloon flights! To book, visit their website or call 800-755-0935. Check out the 2 zipline courses from The Broadmoor! These courses will allow you to experience the Seven Falls in a unique, exhilarating way. You will even rappel across “The Grandest Mile of Scenery in Colorado” in the secluded South Cheyenne Canyon. The course is made up of 10 lines between 2 course that range from 300 feet to 1,800 feet in length. Choose from either The Woods Course for $140 per person, The Fins Course for $174 per person, or a combination of the courses for $242 per person! Visit their website to book or call 719-471-6167.